AMWUA cities offer more than 70 free landscape classes throughout the year to help you grow a more beautiful yard with less water. Local experts introduce you to a wide variety of desert plants and how to use them to design shady and colorful spaces that attract birds and butterflies. Topics also include how to select, plant and nurture trees, how much and when to water, how to grow vegetables and herbs in the desert, and how to operate your irrigation controller. This fall the City of Glendale is offering five classes, including one called "Backyard Composting." There are several reasons why desert dwellers put time and energy into becoming backyard composters. Some talk about the magic of science that turns their kitchen scraps and yard trimmings into something that looks like rich, dark soil. For others, it’s about growing the best tomatoes on the block or creating a booster for container gardens. People who take the time to compost will tell you they want to decrease the amount of garbage they pack into large plastic bags and send to landfills. When compost – officially called a “soil amendment” - is used on trees, plants and vegetables the water is more readily absorbed. That can make deep, infrequent irrigation more effective and help you use water more wisely. Here are just a few tips about basic backyard composting that you’ll learn at the Glendale class offered 6 p.m. Nov. 8 at the city’s Main Library. Container: Compost containers must be at least one cubic yard (3 feet by 3 feet by 3 feet) to get the kind of microbial activity you need to create compost. You can buy a container specially made for composting through a gardening outlet. You also can check with your city’s solid waste department. Some cities recycle old trash and recycling cans into inexpensive compost bins. They remove the bottoms, drill holes in the sides to facilitate aeration, and keep the lid on to help prevent evaporation. Composting material: Anything that once grew roots and leaves – or is made from something that once grew roots and leaves - is a suitable composting material. You need nitrogen (often green) and carbon (often brown) to create compost. Nitrogen is most likely supplied by your kitchen waste, such as the woody stems on asparagus and broccoli, a celery stump or the lettuce you forgot about in the back of the refrigerator. Dried landscape materials supply carbon, such as wood chips from a trimmed tree limb, dried leaves or a pile of lawn clippings left in the sun for a week. (Fresh, green lawn clippings are a source of nitrogen). The smaller the size of the composting material the quicker it changes into compost. Never use bones, grease or meaty leftovers in a compost pile. These food items need different microbes to decompose. Never use cat or dog droppings, or droppings from any animal that consumes meat. These droppings harbor unhealthy bacteria that composting does not destroy. It’s fine to add manure from cows, horses, goats, rabbits or llamas. Oxygen: The composting material changes into compost through the work of microbes. These microbes need oxygen. They get that oxygen when the compost is “turned” or churned. The more frequently the compost material is turned the more oxygen the microbes get, the harder they work and the faster the compost is finished. Some composting containers come with a handle that turns and tumbles the composting material. Other gardeners prefer to simply transfer their material from one container to another with a shovel. Water: Composting microbes also need water. In the desert, compost bins tend to dry out. (Turning your compost by hand lets you find dry spots.) Your compost material should be warm in the middle and as moist as a wrung sponge. If you squeeze it and water comes out, it’s too wet. Add carbon with some dry materials. If the pile is crispy, it’s too dry. Sprinkle it with water and add some nitrogen. Patience: Finished compost equals 40 to 50 percent of the volume of composting material used. 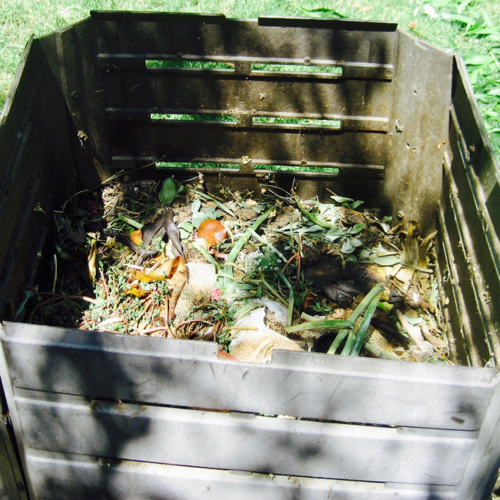 A single typical compost bin could produce one to two wheelbarrows of compost in 6 to 10 weeks. Finished compost is rich, dark, soft and earthy. If your compost still has chunks, microbes are still working. Instead of helping your plants, microbes in unfinished compost will draw nitrogen from plants and soil to stay alive. So, you just can’t see yourself chipping, shredding, collecting and turning your way to compost? AMWUA has a list of free city landscape classes on its website. Take a look. You’re likely to find a class you need. Some cities are offering classes right now. Others will be posting soon.